More than 55% of consumers visit stores before buying online, emphasizing the idea that high-touch physical and seamless omnichannel experiences are critical for modern retailing. Editor's note: The following is the fourth installment in Retail Dive's Consumer Survey, a six-part series examining the psyche of the American consumer and the evolving role of the brick-and-mortar store in the shopping journey. Check out all of our results on our landing page. The shopper journey continues to evolve as the path to purchase increasingly crosses between physical and digital worlds — and as consumers today bounce between stores, desktops and mobile devices, retailers are working to devise seamless omnichannel experiences to best serve these changing behaviors. In the first installment of the Retail Dive Consumer Survey, we determined that the ability to see, touch and feel products ranks highest among the reasons consumers choose to shop in stores versus online. For our latest and fourth installment, we explore the connection between digital and physical browsing and buying habits, asking 1,248 consumers how often they visit brick-and-mortar stores to see, touch and feel products before ordering them online. According to our results, the notion of “see in store, buy online” has been confirmed. More than half of surveyed consumers said they visit a store — at least occasionally — to see, touch and feel products before ordering them online. Even though shoppers have so many paths to purchase these days, many still want to “kick the tires” before buying. This suggests that there’s some room for improvement across e-commerce sites, including the way items are displayed, product descriptions and even customer service interaction. Advances in 3D imaging and virtual reality could be possible gamechangers down the line, however, attracting more shoppers to buy online without seeing products first-hand in a physical store. Visiting stores to see items before buying them online tends to correlate with age, too. The older the shopper, the more likely they are to visit stores first to see products. A much higher percentage of younger shoppers are more comfortable buying items online sight unseen. It’s not unusual these days for the path-to-purchase to have multiple touchpoints crossing between the physical and digital worlds. Our latest survey findings show that 56% of shoppers say they visit stores — at least occasionally — to first see, touch and feel products before buying them online. What’s more, roughly a third make this practice habit, reporting that they always or frequently go to stores to see or try out items before buying on the web. One in 10 shoppers say they always visit a store to see items they then buy online. Because a majority of shoppers are still visiting stores before buying products online, it remains critical for retailers to provide a high-touch in-store experience. Turning physical retail space into showrooms — where customers can try and test products and generally get to know the product better before making the final purchase online — may be the logical next step for retailing. The concept has long been common practice in the furniture and home furnishings space, and now more apparel showrooms are starting to emerge. A strong correlation exists between age and shoppers who say they want to try-before-they-buy online. The older the consumer, the more likely they are to shop the “old-fashioned” way by visiting stores to first see, touch and feel items before ordering online. 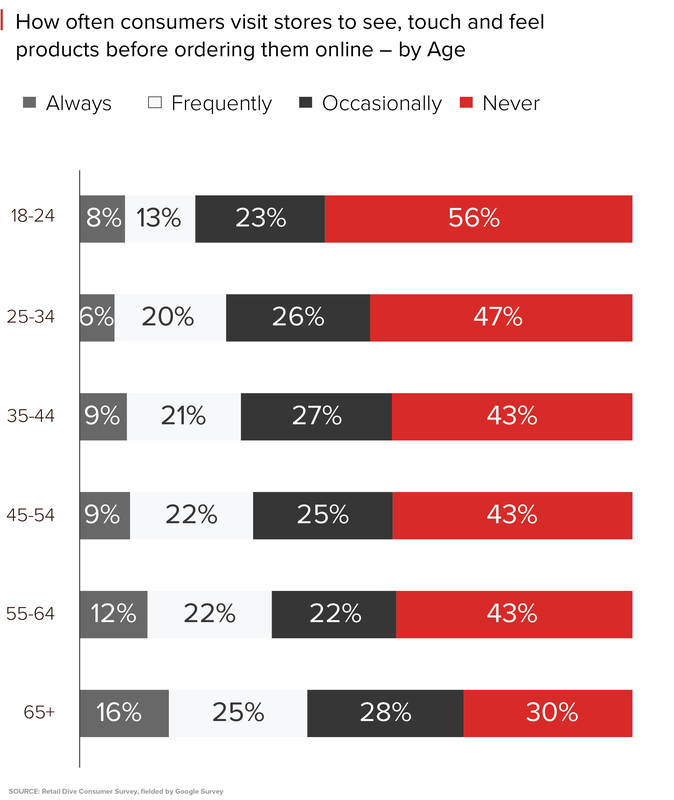 In fact, 70% of consumers in the 65+ age segment first visit a store — at least occasionally — to see products before buying online, and 41% of these oldest shoppers say they always or frequently do so. Conversely, younger shoppers are more trusting when it comes to ordering online without first seeing the items in a physical store. More than half (56%) of 18-24 year-old shoppers say they buy products online sight unseen. Not remembering a world without the web, many of these young tech-savvy consumers use information at their fingertips to conduct pre-purchase research and read online reviews, which makes online buying less circumspect. In fact, 70% of millennials trust consumer opinions posted online, the highest of any generational cohort, according to Nielsen’s 2015 Global Trust in Advertising study. Our findings back up the notion that digital natives, for the most part, aren't dependent on the physical store: Just 21% of shoppers age 18-24 say they always or frequently go to a store to check out products before buying them online. Another 23% say they do so occasionally. 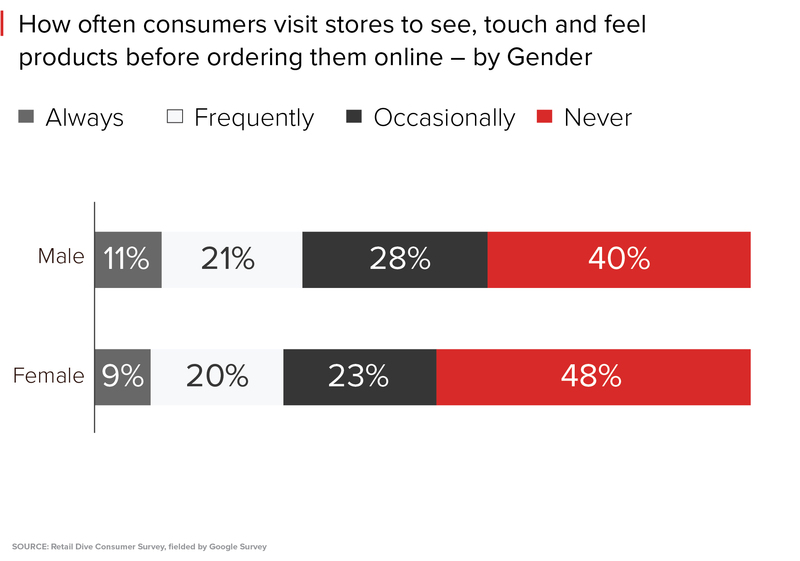 Male shoppers have a higher propensity than females to first visit stores to see, touch and feel products before placing orders online: 60% of men, versus 52% of women, say they at least occasionally, if not more often, visit a store to see or try out items before buying them online. 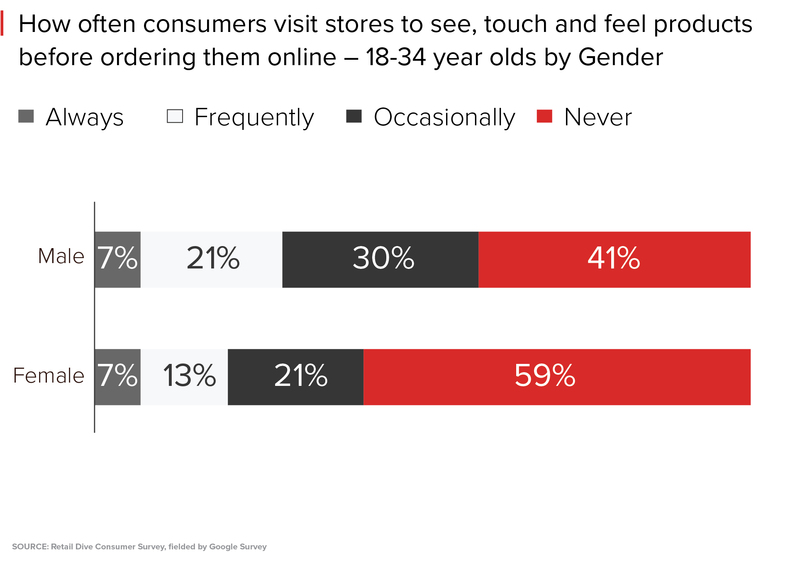 As it turns out, it’s younger men that are driving this phenomenon: 59% of males in the 18-34 age range, versus a significantly lower 41% of 18-34 year-old females, say they visit stores to see, touch and feel products prior to ordering them online. What’s more, 28% of these young men say they always or frequently do so, compared with 20% of young women. Big-ticket electronic purchases could be playing a role here. Young male shoppers are a prime target for electronics and likely want to try-before-they-buy and talk with store employees before dishing out big bucks online. The fact that so many shoppers still want to physically see, feel or try products before buying online speaks volumes about how the shopper journey is evolving. Whether online or offline, retailers and brands must be on their game, providing a compelling experience for shoppers to interact with products. In the physical world, this translates to stores with high-touch and informative product displays. Having experienced and knowledgeable store associates capable of addressing shopper questions, or equipping staff with technology to help them, is equally as important as brick-and-mortar retailers take steps to stanch sales seemingly ready to slip away to online competitors like Amazon. This means retailers need to be proactive about things like matching prices, offering free home delivery for large, bulky items and having a seamless omnichannel process in place to help win the final sale regardless of channel. In the digital realm, retailers must continually apply new and increasingly sophisticated technology to improve their websites and mobile apps, showcasing products in such a way that makes shoppers comfortable buying products sight unseen. Retailers should consider, for example, adding augmented and virtual reality or 3D photos with 360° and zoom capabilities. VR, in particular, holds promise for retailers and marketers to demonstrate their wares in profound new ways — both online and in stores. Stay tuned for the next installation of the Retail Dive Consumer Survey series, in which we examine how often consumers research products online prior to shopping for those items in brick-and-mortar stores. We'll be back.